When you buy French train tickets on Loco2 the rail operator (SNCF), issues tickets in French. We've created a guide in English to make it easier to understand your tickets. 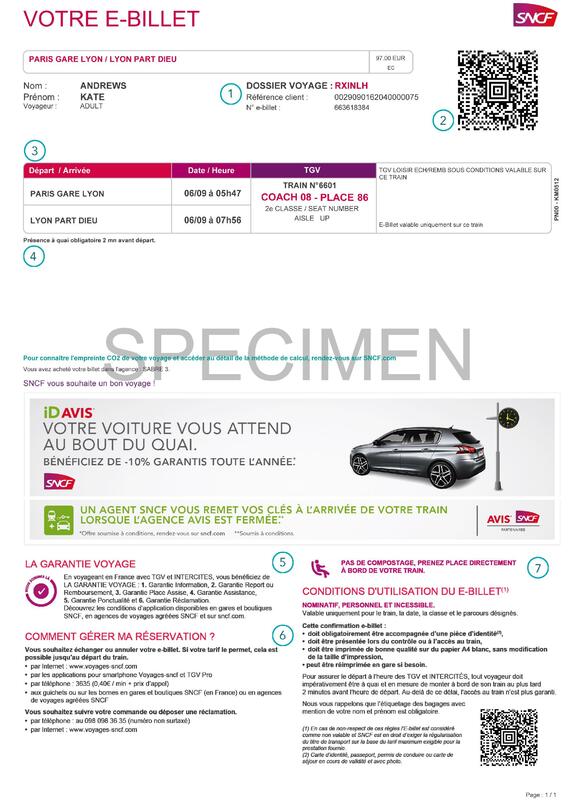 Tickets from SNCF are issued by the rail operator with the key information printed in French. Each number corresponds to a note below, which contains information to help you understand your ticket. 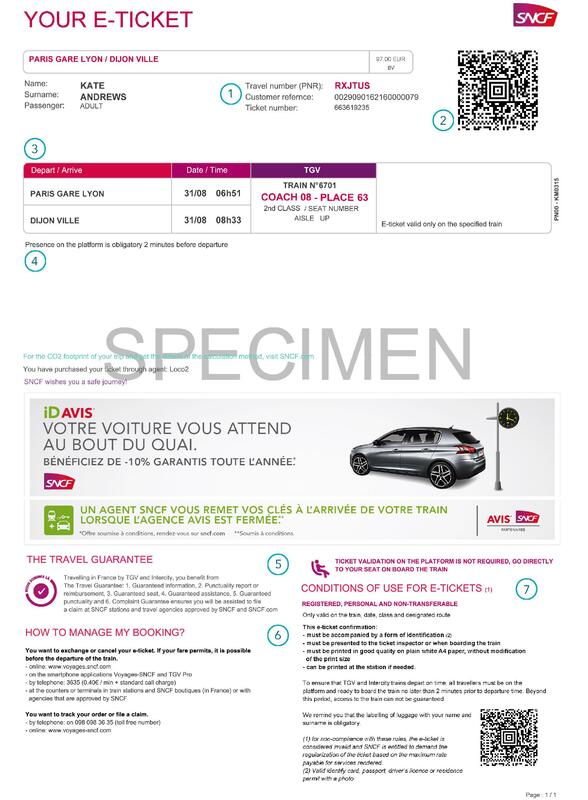 Here’s the same SNCF ticket translated into English. Your Dossier Voyage is the rail operator's reference number for your trip. Often referred to as a PNR - short for "passenger name record" - it contains information about your itinerary and passengers. You won't usually need to pay any attention to it, but it may be requested by the operator after travel, for example if you make a a claim for a delay. This barcode will be scanned by the ticket inspector on board the train. For paper tickets, make sure it's clearly printed and be careful not to bend it. The same barcode will appear on mobile tickets too, but it isn't permitted to present a print-at-home ticket on a smartphone. Summary of your journey including origin and destination stations, time and date or travel and your seat/coach number. These are contained in your Loco2 booking confirmation and you can view this information in your account. Travellers are required to be on the platform and ready to board the train at least 2 minutes before the train is due to depart. La Garantie Voyage™ (travel guarantee) refers to SNCF's commitment to passengers on board TGV and Intercity trains. It includes promises about providing information, assistance if you encounter a major problem during your journey, and commitments about running on time including responding to claims. Our Help article contains further information and advice about Submitting a claim to SNCF. If necessary, the rail operator's PNR (see #1 above) can be used to access details about trips booked with Loco2 on SNCF e.g. on their website, or at the station. With the PNR, staff are able to make limited changes to your booking, for example exchanging a ticket (if permitted by fare conditions) at the station. For most queries, it's best to contact us at hello@loco2.com. It's important that you read and understand the terms of your e-ticket. These apply to things like printing the ticket clearly, labelling your luggage and carrying ID on board the train. They're also incuded in the terms and conditions associated with your order. If you book a bicycle space on a TGV, your bike reservation will be shown on your ticket alongside your seat reservations. To board a train with your bike, you should arrive on the platform in plenty of time and make yourself known to staff.